The Canadian Cancer Society, a leader in cancer control in Canada, organized a two day science-based, groundbreaking conference about pesticides and cancer, in Toronto on Nov. 12-13, 2008. Experts from world renowned organizations such as the International Agency for Research on Cancer, World Health Organization and the U.S. National Cancer Institute lead discussions on the state of the science on pesticides and cancer. While the Society is an active advocate for banning the cosmetic use of pesticides, the focus of this conference was non-cosmetic use, for example, spraying agricultural crops. Presenting the body of evidence about adult and childhood pesticide exposure - at work, in communities, in what we eat and its association with cancer risk. 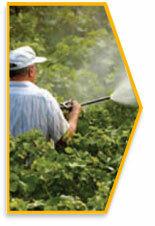 Presenting precautionary-based policy alternatives to minimize pesticide exposure. Building a knowledge exchange network about pesticides and cancer for the public, health care professionals, public health practitioners and decision makers. Identifying gaps in current research. The discussions from the meeting are summarized in the Conference proceedings. 2008 Canadian Cancer Society. All rights reserved.